Talk about flower power! 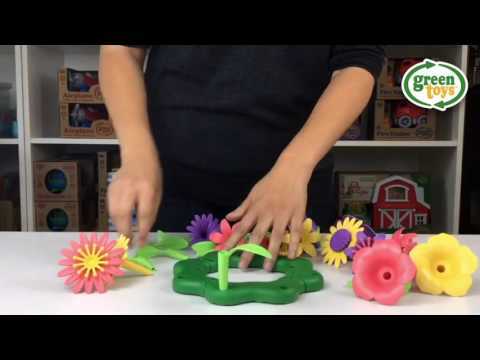 With the Green Toys Build-a-Bouquet budding florists can create countless floral arrangements while saving energy and reducing greenhouse gas emissions. Made in the USA from 100% recycled plastic milk jugs this brightly coloured 44 piece set includes 4 bases 16 stem and leaf pieces and 24 flower pieces. The vibrant lilies petunias and daisies stack interchangeably in the assorted stems for limitless fun that blossoms in all seasons. Its no secret that this garden is as safe as it is fun with no BPA phthalates PVC or external coatings. Packaged using recycled and recyclable materials and printed with soy inks. This is a really cool toy that my 2 year old loves! It gets her mind thinking and she loves building up up and up, I'm sure she will find many new ways to engage with it as she grows. Glad I found this one! I bought this toy as a gift for my granddaughter's 2nd birthday. It has been a great hit with her. She just loves building the flowers and matching up the colours. Her mother loves it too as it keeps her occupied and she is now going to buy one for a friend's daughter who will also be turning 2.
them on top of each other and counting how many flowers there are, to looking at colours and shapes, and even talking about how flowers grow - this activity was such a great tool for teaching.